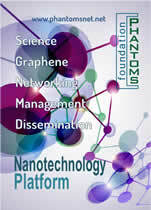 The Phantoms Foundation (non-profit organisation) was established on November 26, 2002 (in Madrid, Spain) in order to provide high level Management profile to National and European scientific projects such as AtMol (ICT/FP7 Integrated Project), EUPHONON (Building a European NanoPhononics Community – ICT/FP7 Coordination Action) or NanoSpain (Spanish Nanotechnology Network). - The Phantoms Foundation received in 2013 the official recognition as Lead Collaborator of ICEX, Spain Export and Investment to coordinate the Spanish Nanotechnology Plan funded by ICEX and to bring to international exhibitions and conferences “Nanoscience and Nanotechnology Spanish Pavilions”. - Coordinator of the Spanish Nanotechnology Network "NanoSpain" (374 groups). - Organisation of high-level scientific conferences/workshops on Nanoscience & Nanotechnology: "Trends in Nanotechnology" International Conference (TNT2018), Imaginenano2018, Graphene2018, Recent Progress in Graphene Reserch (RPGR2018), nanoBioMed2018 and events co-organised with the European Commission or ICEX. - Publication of focused reports on specific areas of interest for the Nanoscience/Nanotechnology Community (prepared in collaboration with the European Commission or Spanish Governmental Institutions). These reports provide focus and accelerate progress in identified R&D directions for the EC programs, guide public research institutions keeping Europe at the forefront in research and also provide a valid source of guidance for governmental Institutions. - Development of a multidisplinary WEB site providing information on Nanoscience & Nanotechnology (N&N). Such initiative allows to strengthen excellence, allow research for the advancement of knowledge and its industrial application; and increase the impact of Nanotechnology worldwide. - Coordinator of the dissemination activities within the Coordination Action EUPHONON (FP7-ICT): Building a European Nanophononics Community. - Coordinator of the dissemination activities within the Integrated Project AtMol (ICT-FET): Atomic Scale and single Molecule Logic gate Technologies. - Partner within the COST Project TD1003 BioInspired: Bio-inspired nanotechnologies: from concepts to applications. - Coordinator of the Modeling for Nanotechnology "M4nano" Initiative. The founders of this non-profit Association are Dr. Antonio Correia and Prof. Clivia Sotomayor Torres.